Author(s): Malgorzata Szelag, Department of Human Molecular Genetics, Faculty of Biology, Adam Mickiewicz University, Poznan, Poland. Joanna Wesoly, Hans A.R. Bluyssen. STATs promote fundamental cellular processes, marking them as convergence points of many oncogenic and inflammatory pathways. Therefore, aberrant activation of STAT signaling is implicated in a plethora of human diseases, like cancer, inflammation and auto-immunity. Identification of STAT-specific inhibitors is the topic of great practical importance, and various inhibitory strategies are being pursued. An interesting approach includes peptides and peptide-like biopolymers, because they allow the manipulation of STAT signaling without the transfer of genetic material. Phosphopeptides and peptidomimetics directly target STATs by inhibiting dimerization. Despite that a large number of efficient peptide- based STAT3-specific inhibitors have been reported to date, none of them was able to meet the pharmacological requirements to serve as a potent anti-cancer drug. The existing limitations, like metabolic instability and poor cell permeability during in vivo tests, excluded these macromolecules from further clinical development. To overcome these liabilities, in the last five years many advances have been made to develop next generation STAT-specific inhibitors. Here we discuss the pitfalls of current STAT inhibitory strategies and review the progress on the development of peptide-like prodrugs directly targeting STATs. 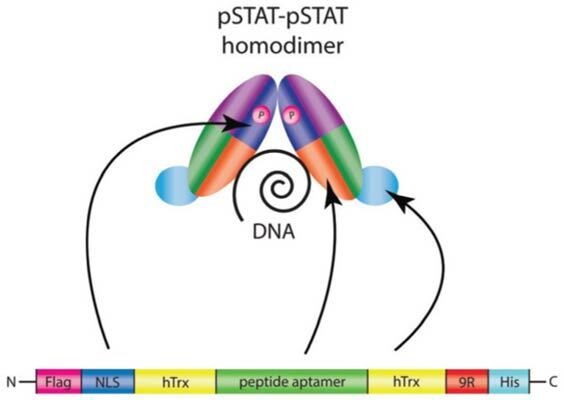 Novel strategies involve screening of high-complexity libraries of random peptides, as specific STAT3 or STAT5 DNA-binding inhibitors, to construct cell permeable peptide aptamers and aptides for cancer therapy. Another new direction is synthesis of negative dominant α-helical mimetics of the STAT3 N-domain, preventing oligomerization on DNA. Moreover, construction of phosphopeptide conjugates with molecules mediating cellular uptake offers new therapeutic possibilities in treatment of cancer, asthma and allergy. Keywords: Biopolymers, dimerization inhibition, DNA-binding inhibition, human diseases, peptide aptamers, peptides, peptidomimetics, STAT signaling. Affiliation:Department of Human Molecular Genetics, Faculty of Biology, Adam Mickiewicz University, Poznan, Poland. Keywords:Biopolymers, dimerization inhibition, DNA-binding inhibition, human diseases, peptide aptamers, peptides, peptidomimetics, STAT signaling. Abstract:STATs promote fundamental cellular processes, marking them as convergence points of many oncogenic and inflammatory pathways. Therefore, aberrant activation of STAT signaling is implicated in a plethora of human diseases, like cancer, inflammation and auto-immunity. Identification of STAT-specific inhibitors is the topic of great practical importance, and various inhibitory strategies are being pursued. An interesting approach includes peptides and peptide-like biopolymers, because they allow the manipulation of STAT signaling without the transfer of genetic material. Phosphopeptides and peptidomimetics directly target STATs by inhibiting dimerization. Despite that a large number of efficient peptide- based STAT3-specific inhibitors have been reported to date, none of them was able to meet the pharmacological requirements to serve as a potent anti-cancer drug. The existing limitations, like metabolic instability and poor cell permeability during in vivo tests, excluded these macromolecules from further clinical development. To overcome these liabilities, in the last five years many advances have been made to develop next generation STAT-specific inhibitors. Here we discuss the pitfalls of current STAT inhibitory strategies and review the progress on the development of peptide-like prodrugs directly targeting STATs. Novel strategies involve screening of high-complexity libraries of random peptides, as specific STAT3 or STAT5 DNA-binding inhibitors, to construct cell permeable peptide aptamers and aptides for cancer therapy. Another new direction is synthesis of negative dominant α-helical mimetics of the STAT3 N-domain, preventing oligomerization on DNA. Moreover, construction of phosphopeptide conjugates with molecules mediating cellular uptake offers new therapeutic possibilities in treatment of cancer, asthma and allergy.